Returning client and expat Lee and his father decided to visit IT lake Monsters to sample some Thailand predator fishing action. On arrival at the predator fishing lake the anglers were soon casting lures at the many showing predators out in the lake. Both anglers were soon landing a selection of predators with Alligator Gar, Pacu and Asian Redtail Catfish all making an appearance. Further casts saw the anglers adding to their tally of predators with further Gar and Pacu being banked. A change over to deadbaits in the afternoon saw the predator fishing action take a turn for the better with both anglers starting to land a series of hard fighting Amazonian Redtail Catfish with weights up to 25kg’s. 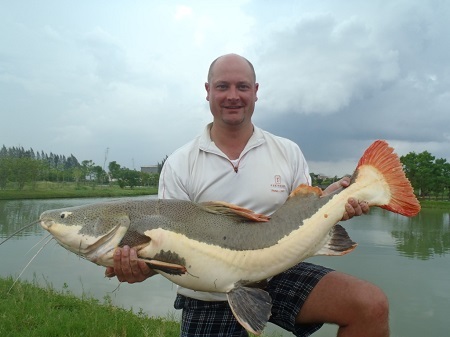 Lees dad also managed a few other predators with Striped Sorubim to 12kg’s and further Asian Redtail Catfish to similar weights. 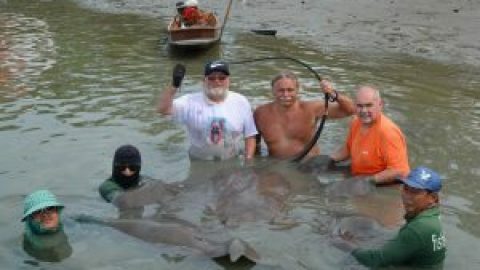 The Thailand predator fishing action continued at a steady pace with the anglers experiencing several double hook ups on a few occasions as a a big shoal of Redtail Catfish hungrily attacked the baited area. 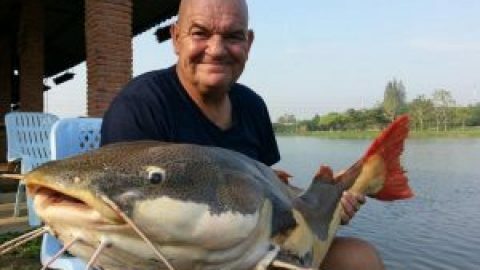 At the end of the days Thailand predator fishing session the anglers had succedded in both landing double figure hauls with lots of hard fighting Redtail Catfish and various other predators with weights up to 35kg’s. Before long the anglers were on their way back to Bangkok to relax over a few cold beers before continuing their annual holiday in Thailand.